It's not often we see new features rolled out for Google Voice, but yesterday the search giant announced it would be adding two new call groups to its service: All Contacts (people who are in your address book or circles) and Anonymous Callers. These features were based upon popular request, according to the blog. What does this mean for Google Voice users? For starters, the addition of an All Contacts group will allow users to effectively eliminate telemarking and other potentially unwanted calls -- all without the need to screen your calls. It's worth noting that Google Voice's existing "Spam" feature works reasonably well already, however. Users, for example, may now set rules which send to voicemail any caller who isn't found in the recipient's address book. 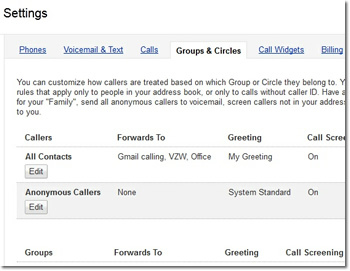 Google Voice users will also be able to handle anonymous callers in special ways too. Special ringtones, custom voicemail greetings, ringing certain phones or even ignoring calls are all options for unknown and non-whitelisted numbers. The last change to Google Voice, which was in February, added the ability to use Google+ circles for contact groups. While certainly not a bad feature, it serves as proof that no Google product or service will be left untouched by the company's "plusification" of everything. Last year, Google and Sprint struck a partnership which integrated Google Voice into the carrier's wireless phone service. Although the blog doesn't say this specifically, there is little reason the new call groups won't also be rolled out to Sprint subscribers just as swiftly. A few months ago, it was rumored that Google was in talks with other carriers about replicating their Sprint deal. As intriguing as that may sound, the telecommunications industry has a long history of playing hardball and maintaining tight control over its products and services. Google will have to offer a very sweet deal in order to entice major carriers to relinquish a portion of their control over subscribers.